I have a custom flat item model which inherits QAbstractItemModel and also has multiple custom roles (columns), like 'species' or 'age'. Is there an easy way to convert this 'List Model' into a 'Tree Model', with a given role (column)? 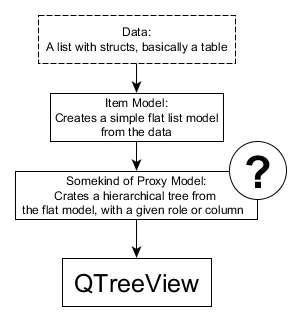 I know there is QSortFilterProxyModel, but it seems it can only filter and sort my model and not dynamically reconstruct it into a tree. Is there a Proxy Model that can do something like this or do I need to modify my data to archive this? @karlheinzreichel But wouldn't this require that I modify my data? I want to dynamically convert any given flat model into a hierarchical one. I found that QAbstractProxyModel has 'mapFromSource' and 'mapToSource', but I am not sure how to modify them, as they would need to point to rows that don't exist in the data. This is hard but the opposite (i.e. tree to list) is trivial. any chance you can structure your original model as a tree instead and convert it to a list later on? @ProgSys I want to dynamically convert any given flat model into a hierarchical one. But when you will convert ANY given flat model into a hierarchical one, you need some kind of parent child relation. How shall a proxymodel know about these relation? @VRonin Possible it is, but if you have a table with many columns, then you would need to create and manage trees for each column, if you wish to display the same data simultaneously in different tree vews. My hope was I could separate the data and the views. @karlheinzreichel I was hoping based on a role or column, but you are right, I do not know how. I guess, I'll just create trees that will reference the original flat data and use them to create tree models.